Building Contractor BAM Building are constructing the new Gluksman Library extension at the University of Limerick. The building, which will rise to an overall height of 32.2m will accommodate offices on the ground floor with teaching facilities on the first, second and third floors. The building also comprises a basement which would require temporary ground support at various pinch points of the site. The ground conditions in the area are challenging with sandy soil, high water table and shallow rock combining to create difficult conditions for temporary works. The majority of the temporary ground support was carried out by using sheet piles in cantilever in conjunction with local ground reductions, but in one location this would prove impossible. At the western end, the basement was to be constructed right on the edge of the site boundary with a local access road running immediately adjacent. 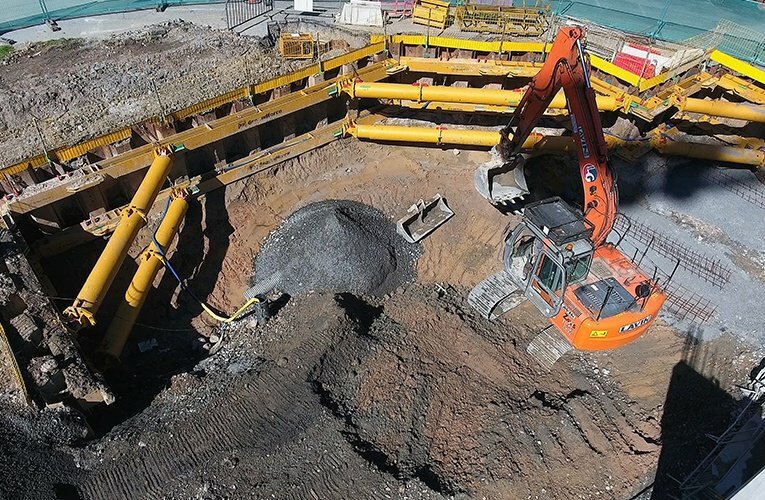 With a dig depth of 3m and bedrock present at 5m below ground level, a cantilevered sheet pile solution was not an option and since there was clearly no question of reducing the ground, BAM needed to find some way of supporting the full depth of the road during construction of the basement wall. The contractor therefore called in Groundforce to design and supply a temporary works arrangement. The task facing Groundforce was complicated by a number of factors including the curvature and reducing level of the access road, the intricate shape of the proposed basement wall and the requirement for one side of the support system to remain open to allow for a continuous pour of the basement slab. The solution developed by Groundforce was to drive interlocking Larssen 603 sheet piles to rock in a series of U shapes and to transfer the load between adjacent sides using walers and hydraulic supports. “This design used the adjacent ground as a “shear key” to provide the required lateral restraint” explains Groundforce General Manager Joseph Lenihan. “In this situation, given the poor shear capacity of the sandy soil, the linear meterage of the sheet piles had to be extended to provide an adequate shear key. Given the presence of services on one of the sides, these extra sheets were required to travel back in the opposite direction from the excavation which is unusual” he adds. Once the blinding slab was cast, the lower level of support was removed allowing the base slab to be cast out against the sheets. Once the base slab reached sufficient strength, the sheet piles could act in cantilever with the top level of support removed and the basement walls cast without obstruction. The basement support element of the works took place between November 2016 and February 2017 with the project due for completion in Q3 2017.